If you’ve been in central Brisbane recently, you will know there is a new visitor in town. 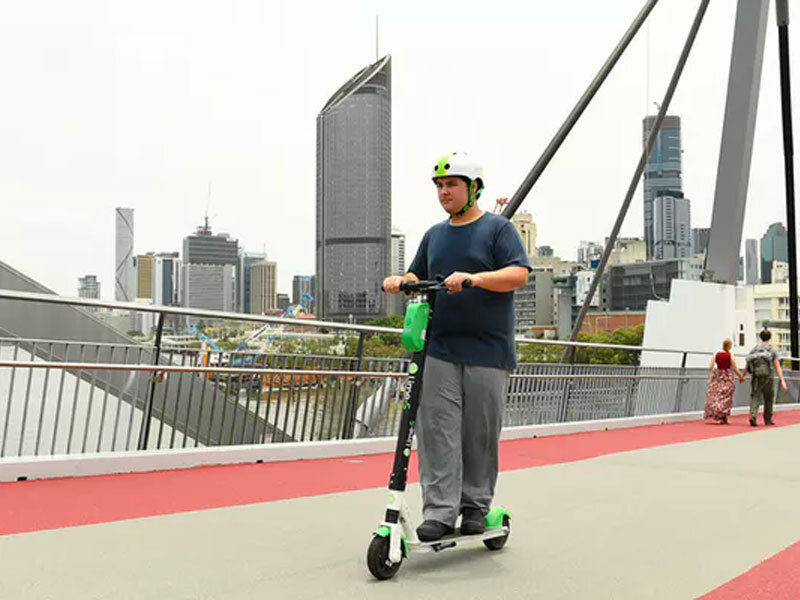 Lime e-scooters have popped up all over the CBD and neighbouring suburbs. 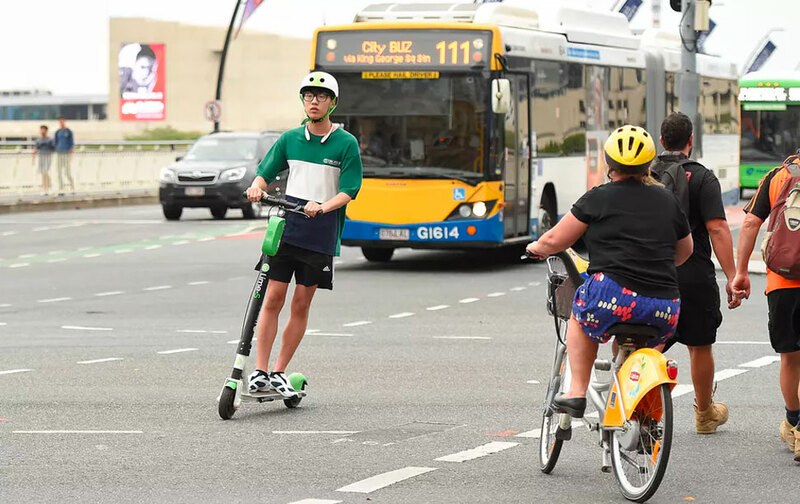 It’s early days for this new mobility provider, so we can’t say if this is a permanent fixture with certainty, but here’s a transport research team’s view on the Brisbane trial and its implications. Transport disruption makes life difficult for policymakers and transport agencies. Queensland at first attempted to deter illegal ride-sharing but then legalised Uber and Ola in response to public demand. E-scooter sharing systems might be just as transformative for people’s travel. You can download an app, sign up quickly and for only a dollar unlock a scooter, hit the accelerator and zip down the street at up to 25km/h. Scooters can be picked up and dropped off on footpaths throughout the central city. They offer low-cost travel and produce low carbon emissions. Lime has received a “temporary pass in Brisbane”, allowing up to 500 e-scooters. The trial in Brisbane is helping the city and state see if it works and will help determine an appropriate regulatory approach. Lime was initially given a “temporary pass in Brisbane”, allowing up to 500 e-scooters. As long as riders wore helmets (either provided by Lime and attached to each scooter or bring-your-own) and rode them responsibly, there would be no problem. Kudos to the Queensland transport minister and his department for being the first in Australia to allow a trial and, more recently, for improving the regulation of these operations. Well done also to Brisbane City Council for allowing the trial in the central business district and working with Lime on the roll-out. It was especially helpful that the council’s contract with its bike share operator did not prevent e-scooters from competing for riders. When you take off on one of these e-scooters, it is liberating. If you’ve used a kick scooter before, even as a child, these new versions are relatively intuitive to ride. The electric motor means Brisbane’s hills are suddenly no problem. A trip from our South Bank campus across the river and through the botanic gardens to connect to a downtown meeting took six minutes and cost just over $3. No other mode of transport would compete in terms of either time or cost for such trips unless you bring your own bike or e-scooter with you into town. Thousands of residents and tourists are using the e-scooters in Brisbane each day. Our sources tell us over 100,000 users have made over 300,000 trips since the mid-November launch. Parking behaviour is also improving. Riders cannot lock the scooter (and stop paying for it) in locations where it might cause a nuisance, such as on the main green bridges. They are both encouraged to park out of harm’s way and forced to submit a photograph of their parking attempt. Park poorly a few times and Lime will suspend your account. Brisbane has not built much bicycle infrastructure in the last five decades, a few notable bridges and riverside paths aside. Nor have we reduced local street speeds to 30km/h, as is now standard European practice. There aren’t obvious safe routes to use when scootering through parts of the central city. - high fees to pick up and impound scooters that operators fail to collect. Brisbane City Council is talking of a probable monopoly, awarded via tender. This is the approach used since the city’s first tram operations in the 1880s. If Australian cities do award monopoly rights we hope they adopt Santa Monica’s use of a levy on the operator that is hypothecated towards improving the city’s bike lanes and bike paths, to create more safe riding space. 5. These scooters need to be part of the coming move towards subscription mobility services. Soon we are likely to be offered “mobility as a service” and pay one monthly fee to get public transport plus ride share, bike share and scooter-share trips, some car-sharing and maybe some taxi kilometres. Based on the demand seen in Brisbane, e-scooters should be included in these packages. Benjamin Kaufman is a PhD Scholar in Transport at Griffith University. Matthew Burke is an Associate Professor, Cities Research Institute at the Griffith University.